Jewish women and their children rescued from Arab villages light Hanukkah candles for first time since being rescued. About 70 women rescued from Arab villages with the help of the Yad L'Achim organization lit Hanukkah candles together with about 120 children at a ceremony Yad L'achim hosted for them and their children last week. It was the first time many of the children had ever lit Hanukkah candles. ""This is a special event that has become a tradition over the years," the Yad L'Achim organization said in a statement. "But this year we were surprised to record nearly 200 participants. The event itself was exciting, because for some of them this is the first time they've lit Hanukkah candles since being freed." Among the participants in the event were a number of women who were rescued only a few months earlier. During that special day, which was held this year in Ashdod, the rescued women and their children participated in many activities and attractions, including boat sailing. The children participated in the candle-lighting ceremony at the end of the day. The Chief Rabbi of Ashdod, Rabbi Yosef Sheinin, said that it was heartwarming to see so many Jewish women returning to Judaism with their children. 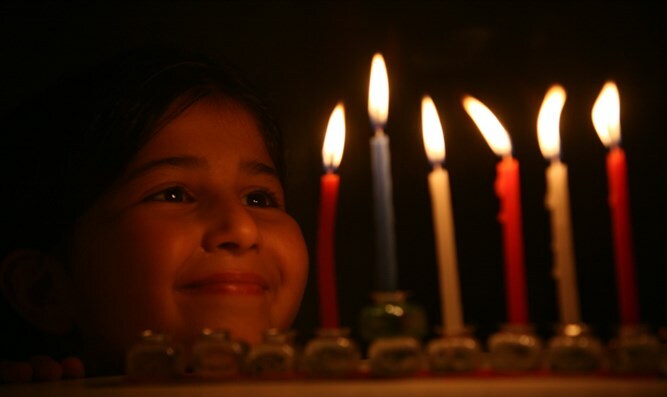 "It is exciting to see Jewish children lighting Hanukkah candles for the first time in their lives, and their mothers shedding tears of joy." Rabbi Sheinin said.